Sabrina, a Sumatran/Bengal mix, was born in 1998. She was found in the backyard of a rural Texas home with two other tigers. Their owner passed away due to drugs and they were left to somehow survive on their own. It was ten days before anyone knew he’d passed, leaving Sabrina with no food and very little water. She’d somehow escaped her cage and authorities finally had to sedate her to get her into a travel trailer. See photos from Sabrina’s rescue here. 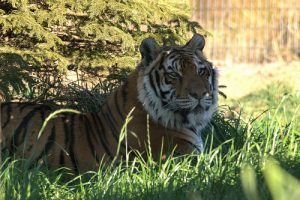 Why Wild Animals Shouldn’t Be Pets: A ManageMyLife.com article mentioning Sabrina’s story. Her story doesn’t stop there. She was then left in the trailer for a week, before being placed at Pride Rock Wildlife Refuge in Texas. There, she finally got the food and water she desperately needed from being severely dehydrated and malnourished. After hearing about her triumphant story of survival, we drove to Texas to pick her up, knowing TWS would be a wonderful forever home for her. Sabrina arrived at TWS in the spring of 2010. She was fearful and confused on her day of arrival, terrified of the people around her. She’d lost the only home she knew, and had memories of the struggles she’d been through. Little did she know, this new home would only treat her with the respect and compassion she deserved. After months of working with her, now Sabrina knows how to relax. She’s still nervous around new faces, but she knows after a week of seeing them that they’re nothing to be afraid of. She enjoys shredding boxes and playing in the snow. She loves it when her caretakers make her snowmen, and even took part of a snowman, rolled it around, and made herself a tiger size snow ball! During the summer, you’ll find her relaxing in the sun or “hiding” in the grass to surprise her caretakers. Her transformation inspires us all and reminds us what compassion can really do for animals in need. You can help provide daily care for Sabrina by becoming her sponsor parent. How special would it be to show her your true love, too?